Poeteka is an Albanian quarterly culture magazine that mainly focuses on literature, the arts, culture and the debating of social issues. Since 2005, it has published four print-editions and a special issue every year. The “Poeteka movement” is a self-organizing group of writers, literary critics, translators, academics, social activists and artists. 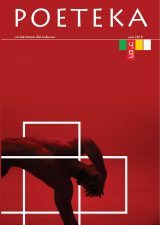 Through artistic texts (poems and short stories,) essays, philosophical debate, current and historical arguments, the monodrama corner, chronicles, writers’ profiles and an In-Memoriam section, Poeteka intends to give more space to the contributors and a clear picture of the Albanian cultural and social context. From time to time, the magazine has also published articles and opinions by foreign authors who convey European perspectives on culture and social life to the Albanian reader. Special issues have dealt with the literary heritage of dictatorship in Albania; undergroundliterary and political dissidence; European poetry in Albanian translation; war writing from the First and Second World Wars, as well as today’s military conflicts; taboo topics in Albanian literature; the cult of the “New Man” as a totemic topic in Albanian Socialist Realism; authoritarianism, populism and mass culture; and questions of identity in new Balkan societies. Poeteka regularly organizes literary and cultural events, including “The Balkan nights of readings and debate” (2007/2008); literary conferences entitled “Meta(L)f(L)ora” and “Liter(N)atura” (2011/2012); and a seminar entitled “Everything is translated –everything is translation” (2012). In 2014, in cooperation with educational institutions, Poeteka organized a lecture series and associated events on the Italian film director, poet and writer Pier Paolo Pasolini. The journal is committed to overcoming the legacy of Albania’s post-war isolation and places a premium on the promotion of translation programmes aimed at the exchange of literary works and ideas. Poeteka has published the works of Albanian authors including Ismail Kadare, Ali Podrimja, Fatos Kongoli, Ali Asllani, Frederik Rreshpja, Martin Camaj, Mira Meksi, Zija Çela, Ardian-Christian Kyçyku, Salajdin Saliu, Moikom Zeqo, Agron Tufa and Ervin Hatibi; and works in Albanian translation by prominent authors of world literature, including Wole Soyinka, Eugenio Montale, Czeslaw Milosz, Luis Sepulveda, Zbigniew Herbert, Ernest Hemingway, Giuseppe Ungareti, Franz Kafka, Adonis, Henri Bergson, Maya Angelou, Forough Farrokhzad and Edoardo Sanguineti. It has also featured the work of artists such as Gëzim Qendro, Christian Thanhauser, Elisbath Chabuel, Ilirian Shima, Arben Bajo, Ardian Isufi, Magnus Muhr, Daniel Firman and Frank Paul.